Gobbledygeek episode 240, “Bone: Vol. V – Rock Jaw: Master of the Eastern Border (feat. Greg Sahadachny),” is available for listening or download right here, and on iTunes here. Power is the only thing of substance in this world. 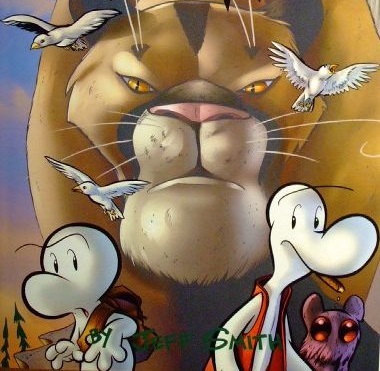 Well, that and Jeff Smith’s Bone, which Greg Sahadachny of The Debatable Podcast joins Paul and AJ to discuss once more. This time, the gang scales the cliffs of Vol. V: Rock Jaw – Master of the Eastern Border. It’s an imposing title for such a straightforward volume, not to mention the shortest of the series thus far. Yet the boys find plenty to talk about, including the introduction of new character Roque Ja, a smooth-talking feline whose name no one can pronounce; the moving tale of Smiley and Bartleby the rat creature cub; and whether or not Smith gets away with the dreamlike narrative. Next: Paul and AJ face the music with a new Geek Challenge. AJ must listen to Floodland by Sisters of Mercy, while Paul has to give John Lennon/Plastic Ono Band a spin. This entry was posted in Four-Color Flashback, Shameless Self-Promotion and tagged adventure, bartleby, bone, books, comedy, comics, fantasy, fone bone, gobbledygeek, graphic novels, itunes, jeff smith, libsyn, literature, podcast, roque ja, smiley bone. Bookmark the permalink.